This tutorial is going to show you how to add new page templates to your WordPress Cherry Framework template. Go to the Pages -> Add New menu to create a new page with a new page template. Give your new page a title and save it. In the Page Attributes panel on the right, you can select a page template from those already included into the template. You need to add a new one to this list. All these page templates are located in the wp-content/themes/CherryFramework folder on your FTP. But you will need to add a new page template in the wp-content/themes/theme##### folder on your FTP. Save the file and upload it to the wp-content/themes/theme##### folder on your FTP. Go back to the page you created in WordPress. 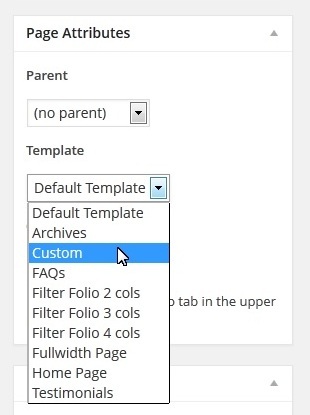 In the Page Attributes panel, you can select the new page template called “Custom”. Click Publish. Then click Preview Changes. The page will be completely blank. Go back to your new.php file to start adding your content. The file may contain anything you need including some static content or some markup that will determine your page content. You can use elements from other page templates located in the wp-content/themes/CherryFramework folder to create a unique page. Now you need to decide what kind of content you’d like to see on that page. Let’s say you have no separate page template for the “Our Team” custom posts. And you really like the layout of the Testimonials page template and would like to see the “team” custom posts with the same layout. Under the Appearance -> Editor menu, you can easily determine the name of the file used for the Testimonials page template. It is page-testi.php. Change page-testi.php to new.php in the code. The code also contains the reference to the loop/loop-testi.php file. This is another file you need to copy. Copy loop-testi.php from wp-content/themes/CherryFramework/loop. And paste it to the wp-content/themes/theme#####/loop folder (if there is no loop folder there, you will need to create it). Rename the file to e.g. loop-new.php and open it for editing. Change the word “testi” everywhere in this file to “team” and save the changes. (You can do this using Control (Command) + F). Save the changes and check your new page. It should have the team custom posts on the testimonials layout page. In case you’re seeking premium themes to put up a professional website, take a look at design wordpress templates. Or check out a wide variety of WordPress templates page for even more beautiful designs.